Well, we are seated at a booth, which walls stood at least five feet tall. It was as if you were in a secluded little restaurant all by yourself. While being seated we noticed there was a “mystery gift,” as we called it, on the table next to ours with balloons and confetti attached. We wondered and commented through our whole meal how we hoped to see who the gift was for and what the gift would be. The food was delicious! We ordered what is known as the Classic Feast, which is a four course mean for two. The first course was a traditional Swiss cheese fondue made with Gruyere and Emmenthaler Swiss cheeses, white wine, a touch of garlic, nutmeg, fresh lemon, and Kirschwasser. It was served with fresh breads, vegetables, and apples. The apples were the best with the cheese in my opinion. The second course was the salad. We chose to have a chef salad and a California salad. The chef salad was made of crisp greens with Roma tomatoes, cucumbers, sliced eggs, smoked ham, and Emmenthaler cheese, topped with our sweet and tangy house dressing. The California salad was made of mixed baby salad greens, Roma tomatoes, walnuts, and Gorgonzola cheese, topped with homemade raspberry black walnut vinaigrette dressing. Both salads came with ice cubes in them to keep the salad cold. Pretty neat, huh? The third course was the meat and veggies. The Classic Feast came with an assortment of center cut filet mignon, garlic & wine marinated tenderloin, peppered pork tenderloin, spinach and Gorgonzola ravioli, chicken pot stickers, and ocean scallops. The filet mignon, garlic & wine tenderloin, and peppered pork tenderloin were EXCELLENT. 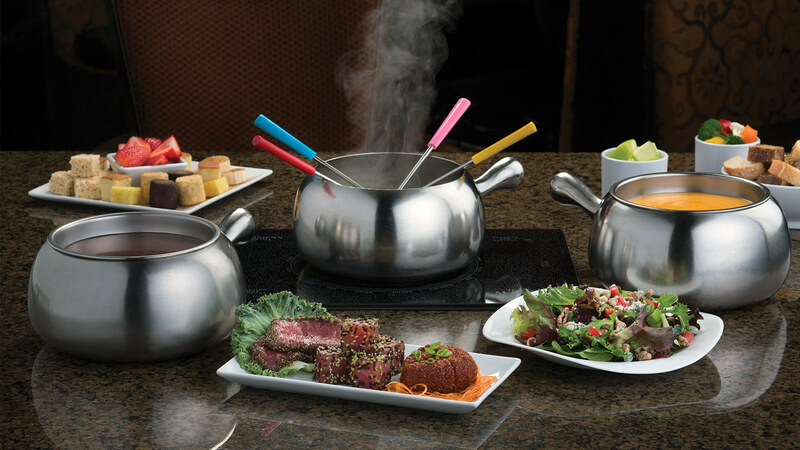 The special fondue mix for cooking your meats and vegetables we chose was coq au vin, which combines the flavors of fresh herbs, mushrooms, garlic, imported spices and a hearty Burgundy wine. The meats were accompanied by fresh broccoli, mushrooms, yellow squash and red bliss potatoes for “dunking” into the fondue. This was the best part of the meal to me. The fourth course was the dessert and probably Sarah’s favorite. We ordered the Flaming Turtle chocolate fondue. This was milk chocolate, caramel and chopped pecans, flambéed table side, and served with strawberries, bananas, and pineapple, plus cheesecake, tasty nutty marshmallows, pound cake and brownies. All of this was to be dipped into the chocolate concoction. It was probably my second favorite part of the meal. As I mentioned before the booth was somewhat secluded from the rest of the restaurant, which was a good thing and a bad thing. It was good because we had some privacy and could talk to each other without worrying about others watching us. It was bad because every time we’d do something kind of goofy, or silly, a waiter or fellow patron would walk by our booth. For instance, Sarah and I were in a silly mood and were doing crazy things during the whole meal. One time, while eating our salad, I got a piece of lettuce stuck in my teeth. Well, I always play around with Sarah and pretend like I’m going to embarrass her when something like that happens. She, wanting to not get embarrassed and being a little silly herself, proceeded to pretend to pick the lettuce out of my teeth. Wouldn’t you know it one of the waiters walked by and, we think, saw us being silly. However, this was not a normal waiter. This waiter had a permanent, weird smile on her face the whole night. We don’t know if she was just happy or laughing at us. Another fun time was at one point during the meal when Sarah leaned in for a kiss. I leaned in to her to return the kiss, but something caught my sight in the corner of my eye. It was our waiter, Ryan I believe was his name, standing at our table. I, not knowing what to do, just turned my eyes towards with my face and lips towards Sarah. He proceeded to ask us questions about our meal and Sarah, I guess from embarrassment, gave me a quick kiss on the side of my lips. The last humorous event for our evening was the amount of liquor used in preparing the dishes. At one point our waiter commented that he would add “just a little bit of wine” to our fondue and it turned out to be probably a quart worth. So needless to say we had our feel of the way brandy, sherry, and various wines taste when cooked. Needless to say, in some instances you’d almost have to be there to understand how funny it was, but I thought you might enjoy a little bit of humor from the everyday life.